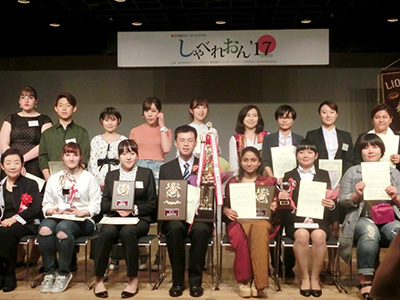 At the Shabeleon speech contest—now in its twenty-sixth year—foreign residents who live, work or go to school in Shinjuku City express their heartfelt thoughts in the language they have worked so hard to learn. They presented various themes, such as what they have felt in everyday life in Japan living away from their home country, their family in their home country, and a comparison of the anime of Japan and the U.S. Thanks to the eighteen participants and the many audience members in attendance, the event was exciting from beginning to end again this year. (United States of America) Waseda Language School Japanese and American Anime—What Is the Difference? Click here to see the speech of the winners (the Shinjuku Foundation for Creation of Future website). ・Congratulations! How do you feel at this moment? I am deeply moved. Since I did not think I would win, I am very surprised. I would like to thank the teachers at the school who supported me. 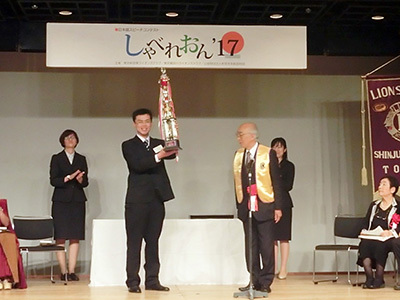 ・Why did you participate in the speech contest? Since I liked acting on stage while I was a university student, I thought I’d like to express myself in front of a large audience. So I decided to participate in the contest as a representative of my school. ・How did you study Japanese? About half a year before I studied abroad in Japan, Japanese-language teachers taught me at the learning center in Beijing. Under the instruction of various Japanese teachers, I learned the four skills of reading, writing, speaking and listening. Keigo, honorific language—which is hardly ever used in China—was particularly difficult to learn, but I believe keigo is beautiful and wonderful. Almost a year has passed since I came to Japan, and I learned Japanese conversation by talking with the Japanese friends around me. During today’s speech, I sang a little bit. I really like karaoke, and go to karaoke a lot. ・How much did you practice for this speech contest? For about two or three months. First, though, I had to memorize my speech so that I could say it without looking at a script. Next, with the cooperation of my teachers and classmates, I practiced in front of people so that I would not get nervous. Finally, to improve my expressive skills, I had to be creative. I checked my facial expressions in the mirror and tried to use gestures more effectively. ・Could you please say a few words to people thinking of participating in the contest next year? As the name suggests, this is a competitive arena. Actually, though, it is a great opportunity for foreign students to express what you are really thinking every day as a foreign resident directly to Japanese people. I’m glad I participated in the contest. Even if you are hesitant, I think you should rise to the challenge! ・Thank you very much! Best wishes for your future endeavors!